The 600-year-old Tibetan Opera has stayed intact from globalization and has been protected and developed well thanks to the substantial support from the government, a leading Tibetan Opera master told China Daily during an exclusive interview. Cidan Duoji, 73, started to learn Tibetan Opera at the age of nine and has devoted all his life to this traditional folk art. 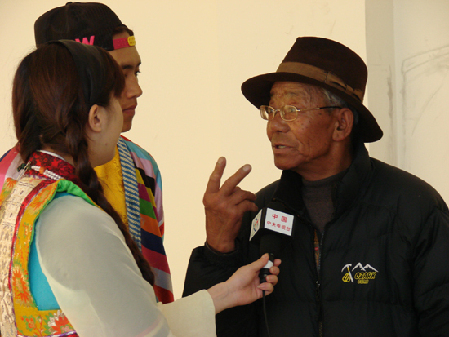 He was originally a performer of Juemulong School, the most developed and popular Tibetan Opera form. Since retiring from the troupe, he spends most of his time teaching students at Tibet University and tutoring the non-professional performers of Tibetan Opera troupes in Lhasa, Shannan Prefecture and other regions in Tibet. “It usually takes four years to master all skills of playing a role. The young performers can’t distinguish the different expression techniques and body movements, so I help them,” Cidan said. He denies that the Tibetan Opera has been weakened by consumerism, globalization and other genres of folk arts, like popular music, emphasizing that it has retained its unique patterns of acting, singing, narration and dancing. Tibetan Opera has always been an important cultural and religious component of Tibetans' social life, and the government has continuously allocated funds to support this traditional art, according to Cidan. Cidan lives a quiet life now and takes care of flowers in his home in Lhasa. He seems to be extremely indifferent to various honors received from the state, such as the Representative Heir of State-level Intangible Heritage Items. But he is certainly devoted to the study and research of Tibetan Opera, helping to sort out historical folk art materials and bringing the lost performance into life again. “I will continue to work until the day that I can’t move. The audience needs performers, and we have the responsibility to keep the quality of this folk art,” Cidan said with a smile. The Tibetan Opera, considered a "living fossil" of Tibetan culture, has many forms and schools of art due to different natural conditions, customs, culture and traditions, as well as dialects of the region. It is generally divided into two sects—the Blue Mask and the White Mask—Juemulong belonging to the Blue Mask sect. During the period of the 13th Dalai Lama, there were 12 Tibetan opera troupes in Tibet. Juemulong is half professional because during the year they not only perform Tibetan opera but also do business. 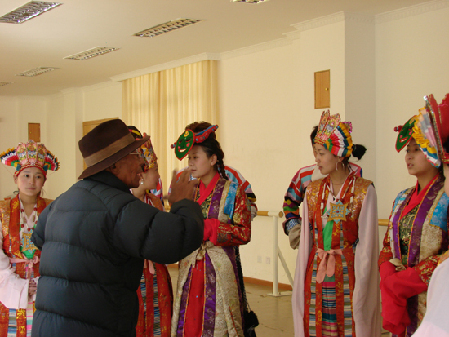 Based on this school, the Tibet Autonomous Region Troupe was established in 1960, and Cidan Duoji became a member of the troupe.